If you want a really filling, low GI meal suitable for vegetarians, then you will love this baked sweet potato stuffed with chickpeas. Wash the potatoes and prick them with a knife. Cook them in an oven preheated to 200°C/400°F/Gas Mark 6 for just over an hour or until soft. 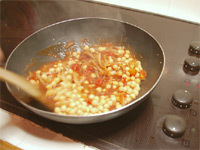 Start to cook the chickpea sauce about 30 minutes before the potatoes finish cooking. 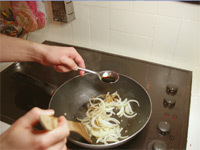 Finely slice the onion and crush the garlic and fry in a little olive oil with 1 tablespoon of balsamic vinegar and Worcestershire sauce. Add the tinned tomatoes and stock cube. Add the chickpeas and heat them thought, stirring occasionally. 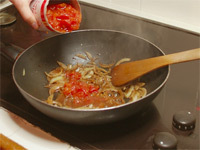 5 minutes before serving add the remaining balsamic vinegar and the chopped spring/green onions. Mix in well. 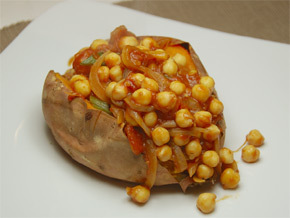 Slice open the potatoes and serve the chickpeas inside.